One would think that the general order of magnitude of various hormone levels would have been made clear in medical, nursing or undergraduate school. Obviously, women make lots of estrogen and men make lots of testosterone, right? Women must certainly make a lot more estrogen than testosterone, right? We hardly hear about androstenedione and dehydroepiandrosterone, so probably not a big deal since they only come up occasionally. That certainly must be true. WRONG! In most cases, a woman's blood level will contain ten times as much testosterone as estradiol. In the luteal phase of the cycle, a woman has about one hundred times as much progesterone as estradiol. Fifty-year-old men make about as much estradiol as their wives. Many men with erectile problems have too much estrogen — not too little of testosterone. DHEA is the most common steroid hormone in the body and we don’t fully know what its function is. Let's take a look at the proportions of the various hormones to get a better feel for what is going on. Interpretation of laboratory work and managing replacement and supplemental therapy require a basic understanding of what is circulating in the serum and how it affects available hormone levels. Estradiol is really powerful stuff. A normal young woman starts her menstrual cycle at about 20-40 pg/ml. Just before ovulation, common serum levels are 150-280 pg/ml which equates to 20-280 parts per trillion in her serum. A menopausal woman on HRT ranges from 20-100 pg/ml. A Vivelle Dot 0.0375 mg/day patch will achieve serum levels of about 25 pg/ml. The strongest patch, Vivelle Dot 0.1 mg/day will give levels around 80 pg/ml. For many menopausal women, that is too high. Progesterone is less powerful. A normal mid-luteal phase young woman has typical progesterone levels of 10-20 ng/ml—10-20 parts per billion in her serum. Progesterone 100 mg pills, capsules or tablets given at bedtime will yield blood test results (drawn the next day) of about 1.5-8.0 ng/mg— one ng/ml = 1,000 pg/ml. Estradiol equal to 50 pg/ml. Progesterone equal to 5 ng/ml. Using the same units as estradiol, progesterone is 5,000 pg/ml. She has 100 times as much progesterone in her serum as estradiol. This is why there will never be a bioidentical progesterone patch. It would have to be very big— there is much more progesterone in the blood than estradiol. 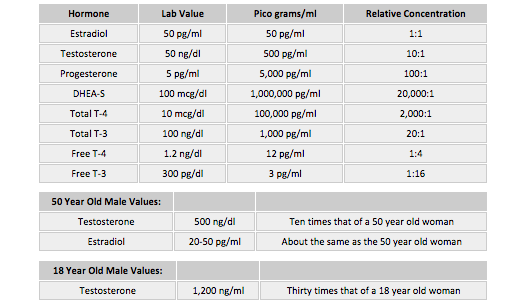 Typical testosterone at any age is between 20-70 ng/dl. Pay attention, as labs have changed the serum quantity units. This is nanograms/deciliter. The nanograms are just like progesterone but the serum quantity has changed from amounts per milliliter to deciliter, which is one hundred times bigger. There are 10 dl in a liter and 1,000 ml in a liter — 50 ng/dl is only 0.5 ng/ml. ﻿Estradiol equal to 50 pg/ml. Progesterone equal to 5 ng/ml. One hundred times as much progesterone as estradiol. Ten times as much testosterone as estradiol. But don't women produce higher levels of estrogen while men make more testosterone? Wrong! Remember: estrogen is really powerful stuff! DHEA and DHEA-S gradually declines with age. The normal values from the lab present such a huge range as to be considered useless. I usually get DHEA-S because it is entirely adrenal in origin and I use it as a measure of adrenal output and health. There will be a separate article on adrenal, but there are some things worth noting: Healthy women in their 20s have levels around 200 mcg/dl. I find that PCOS patients have even higher levels. This has been documented in other publications, but I have never found a good explanation. Good levels for a 50-year-old woman should be around 100 mcg/dl. Let's look at the units again. ﻿One mcg = 106 or one million pg. 100 mcg/dl = 1 mcg/ml. ﻿She has 20,000 times as much DHEA-S in her serum as estradiol.